The inscription appears ANZAC Cove Memorial. One of the processes in dealing with death is the burial of your loved one. The horror and sadness of war is that often those fallen in battle are not buried close to their family but are buried with their mates close to where they have fallen, and in a foreign land. 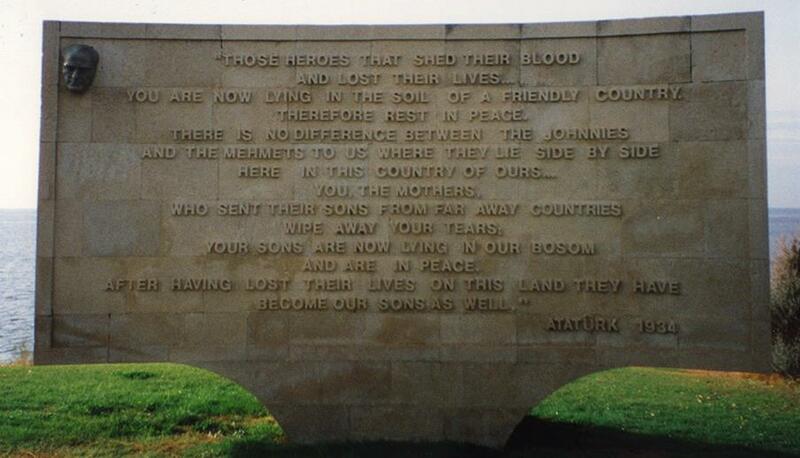 These heart-rending words about the fallen are claimed to be from Mustafa Kemal Atatürk, who was a commander of Ottoman forces at the Dardanelles during the First World War. Later, he became the founder of modern Turkey and graces memorials on three continents. There is debate about the origins of the words but the sentiment is still powerful none the less. 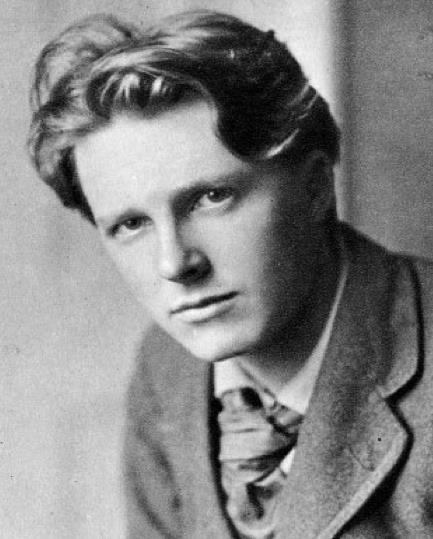 Rupert Brooke (1887-1915) – Poet & Soldier. It was Saturday 17 April 1915 when on the Aegean Sea, Sub-Lieutenant Rupert Brooke’s shared this poem with his close friend, Frederick Septimus Kelly. Kelly wrote in his diary that he ‘enjoyed the sound of [Brooke’s] voice and the way he read’. Brooke and Kelly had already formed a strong bond together as many soldiers had as they prepared for the war to end all wars. The seventh child of a wealthy Irish-Australian family, Kelly had been born in Sydney into privilege, his father having started out as a wool-broker, then became a shareholder in 20 or more mining companies, and finally ending up as Managing Director of the Sydney Smelting Company. Kelly was educated at Sydney Grammar School and from an early age he was already able to play Mozart and Beethoven piano sonatas from memory. Like so many of his era, his wealthy father took his family back ‘home’ to Britain when ‘Sep’, as Frederick Septimus was known to the family, was just 12 years old. Kelly continued his education with his two brothers at Eton College, where he excelled at tennis, hand tennis and football. 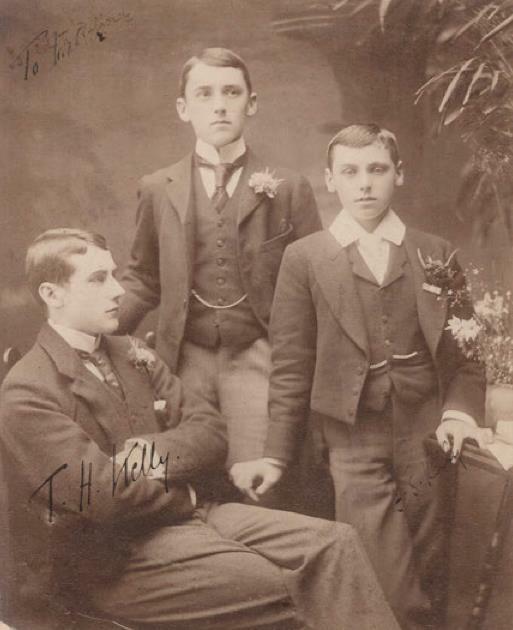 The Kelly brothers at Eton: Thomas at left, William in middle and Sep on the right. But it was when he first got into a boat that he uncovered his true passion, rowing, which was matched only by his love for music. Kelly was a natural since his musical genius brought focus and timing to his fluid style in rowing. He stroked the Eton Eight to victory in the Ladies’ Challenge Plate at the Henley Royal Regatta of 1899. The Ladies’ Challenge Plate for eights was originally a race for the academic institutions in the United Kingdom and Trinity College, Dublin. For the next nine years, Kelly was to find success on the waters of Henley. 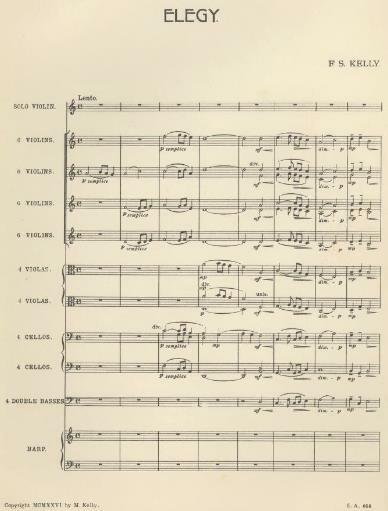 Kelly was awarded a Lewis Nettleship musical scholarship at Oxford in 1900, and went up to Balliol College, Oxford (BA, 1903; MA, 1912), became president of the university musical club and a leading spirit at the Sunday evening concerts at Balliol. In 1900 and 1903, Kelly rowed in the Balliol crew that won the Oxford University Fours. In 1900, he stroked a Trial Eight and was ninth oarsman for Oxford University in the 1901 and 1902 Oxford and Cambridge Boat Races. 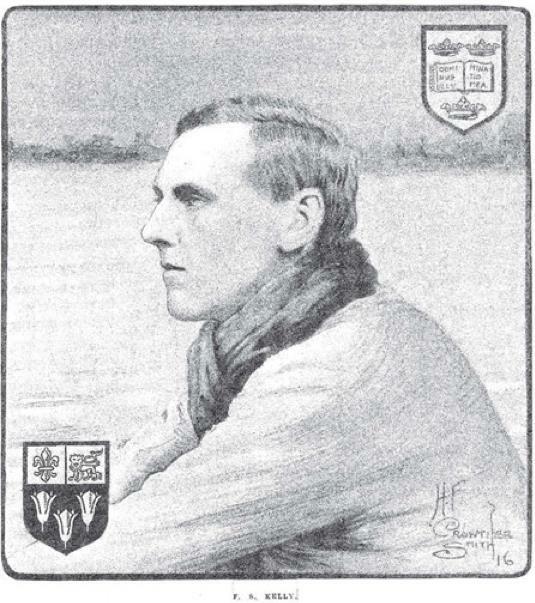 Kelly took up sculling while at Balliol College and won the Diamond Challenge Sculls at Henley in 1902, beating Raymond Etherington-Smith from Leander in the final by a margin of 2 ½ seconds. Kelly then rowed in the four seat for Oxford against Cambridge in the Boat Race in April 1903, with Oxford losing the race by 6 lengths. 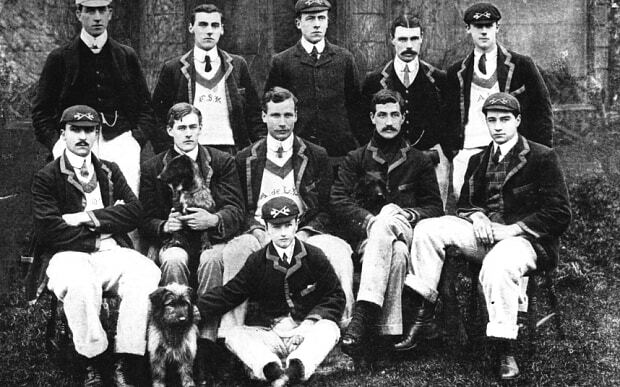 Kelly is top row, second from the left, with the Oxford crew of 1903. Kelly also won the University Pairs and Sculls at Oxford in 1903. He went on to win the Diamond Sculls at Henley again that summer, beating Julius Beresford of Kensington Rowing Club in the final. Later in November 1903, Kelly won the Wingfield Sculls, the Amateur Championship of the Thames, beating the title holder Arthur Hamilton Cloutte. This was the only occasion on which Kelly entered the event. Sadly, Kelly was unable to make it a third win in a row for the Diamond Sculls when, in 1904, he set off too fast and ran out of steam, losing to Canadian Lou Scholes. At the Grand Stand, Kelly was two lengths behind and, totally exhausted, had to stop. He was lifted out of his shell into a launch while the Toronto oarsman crossed the finish line. The Henley crowd was astonished that ‘a sculler with the style of the Canadian, who depended on his arms and legs, and was without body swing, could beat one with the easy and natural form of the Anglo-Australian.’ One reason for the loss, Theodore A Cook wrote later, was that Kelly had only trained in his boat for three weeks before his first race in the Diamonds that year. Sketch of Kelly rowing on the Thames. 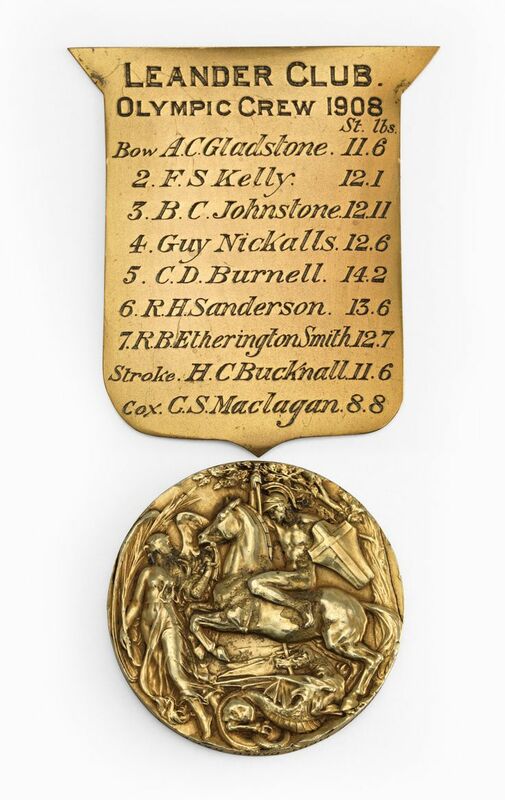 In 1905, Kelly again won the Diamond Sculls, beating Vesta RC’s Harry Blackstaffe. His time on this occasion of 8 min. 10 sec. stood as a record for more than 30 years when the American Joe Burk beat it in 1938. 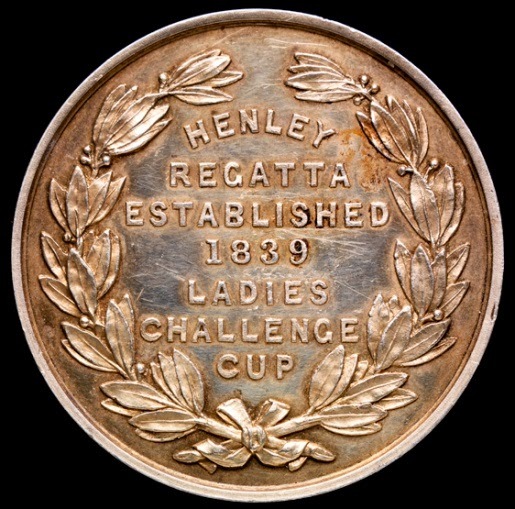 Kelly’s 1905 Pineapple Cup for single sculls at Henley. 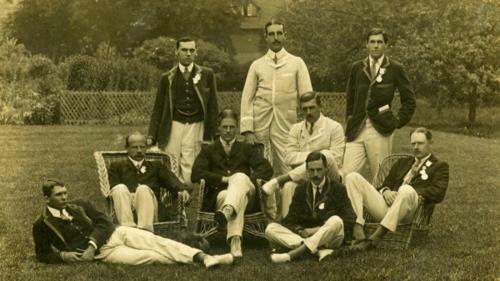 At the 1906 Henley Royal Regatta, Kelly was in the coxless fours that took the Stewards’ Cup. He then resigned from rowing to concentrate on his music studies. Such was his mastery of the art of sculling that Kelly was asked by Rudie Lehmann, a Liberal MP and rowing devotee, to contribute a chapter on sculling for his book The Complete Oarsman, a coaching manual which was published in May 1908, two months before the Olympics started. 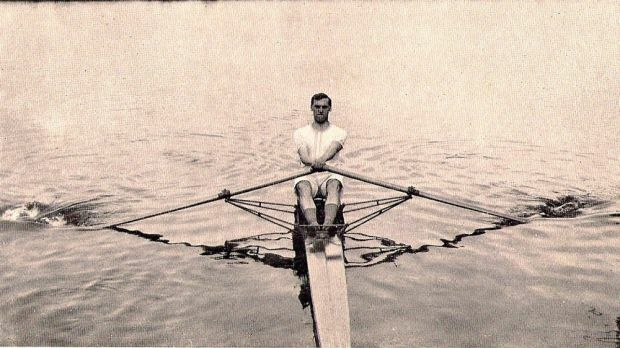 Kelly posing for a series of photos on sculling technique in Lehmann’s tome on rowing. Kelly’s last appearance in a racing boat was in 1908, when he competed at the London Olympic Games. He was a member of the famous Leander crew, the ‘Old Crocks’, rowing in two seat in the eights. Great Britain (Leander) crew for 1908 Olympics; Kelly standing top left. I hardly slept a wink the whole night in anticipation of having to race the Belgians in the Olympic finals of the 8s and when we assembled for our morning run it appeared nearly everyone had had a sleepless night. We went out for a warmup and then hung around the club in misery. We knew we should win but we wanted to establish once and for ever the dominance of our British style of rowing over theirs. After ten strokes we were travelling faster than we had ever done and we began steadily to draw ahead. We had never settled down so well as we did in this race and our stroke was beautifully long and together for the whole of the way. The Belgians had a grande attaque at the top of the island but made no impression upon us and indeed we increased our lead to a little over half a length, and it became evident that every stroke, very gradually, increased our lead. Wanting to win by a comfortable margin, we had decided before the race to go as hard as we could the whole way. They said the margin in the end was two lengths but it felt like three. 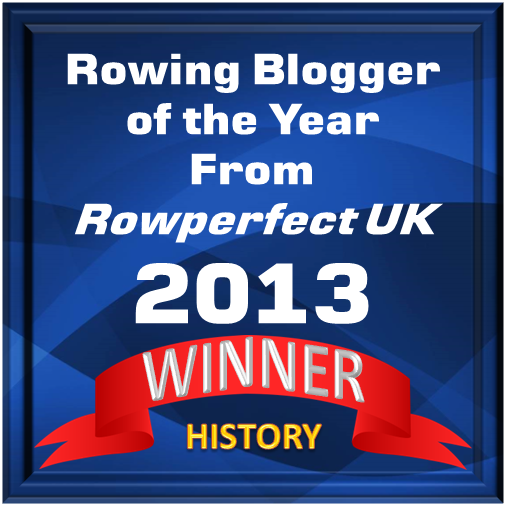 We ended up equalling the 1897 record and winning gold. And so it was a gold medal for Great Britain, rowing on the Henley course, which was so familiar to Kelly. Should Kelly be remembered as the first Australian rower to win an Olympic gold? And now Kelly’s life returned to what he knew and loved, music. From 1909 he advised Sir Edgar Speyer on programmes of the Classical Concert Society, London and, in 1912, succeeded him as its chairman. In 1911, he visited Sydney and between June and August, to the delight of the Sydney critics, gave three solo recitals (with programmes ranging from Bach, Mozart, Beethoven, Liszt, Schumann and Brahms, to recent works of Scriabin and Debussy and his own Cycle of Lyrics). He also gave two chamber music concerts, performed the Beethoven G major concerto with the Sydney Symphony Orchestra, and conducted a chamber orchestra concert when Dame Nellie Melba’s flautist John Lemmone played Kelly’s Serenade for flute and small orchestra. Back in London, Kelly gave three recitals in February and March 1912. Later that year, he played concertos by Beethoven, Schumann, Mozart and Brahms with the London Symphony Orchestra under Sir George Henschel. He also played chamber music and duo-sonatas with such notable instrumentalists as the violinist Jelly d’Aranyi (who, it was said, was deeply in love with him) and the cellist Pablo Casals. However, life was to change. On the day after the Declaration of War, Kelly tried to enlist, using his impeccable society connections to get into 10 Downing Street itself, where Lord Kitchener and Prime Minister Herbert Asquith were in attendance. His own lack of any military training saw him initially fobbed off, although he kept coming back to ask again, and eventually he was successful. Assigned to the Drake Battalion, in September 1914, he went into camp in Kent and immediately felt at home: ‘The first day of our new life has left a very pleasant impression,’ he wrote in his diary. A pleasant impression was also left by Rupert Brooke on their first meeting around the same time. ‘Rupert Brooke is very nice, sensible and mature in all his views. But it was as a Platoon commander of the Drake ‘A’ Company that Kelly’s stickler-for-detail demeanour became a problem. With his insistence on uniform regulations and the minutiae of drill etiquette, which he himself spent sleepless nights memorising, he ‘fell foul of everyone’. His men sang songs deriding him, and when he left barracks at lights-out, it was to the sound of jeers and catcalls, a situation exacerbated by Kelly calling everyone out of their beds for punishment drills. Even when he played piano recitals for his charges, it created, ‘a severe atmosphere’. After a few months, he found himself transferred to a Quartermaster’s position, to which his passions for thorough details and list-making were better suited, but it also meant that, by early 1915 as the Gallipoli plans got underway, it was likely he wouldn’t be called upon to participate. A chance meeting with the influential General Mercer ended all that and on 23 February 1915, Kelly was assigned to the Hood Battalion, joining his close friend, the critic and composer W.D. Browne and Rupert Brooke, along with Prime Minister Asquith’s son Arthur (‘Ock’) as members of the Grantully Castle’s so-called ‘Latin Club’. But after turning in that night, Brooke suddenly took ill, and by morning was in a serious condition. The mosquito bite had turned septic, his face became swollen beyond recognition, and soon he was drifting in and out of consciousness. By afternoon, his condition had deteriorated so rapidly that he was now fighting for his life. ‘Ock’ Asquith accompanied the stricken poet to a nearby French hospital ship, but when Asquith didn’t return, Kelly realised that his literary friend’s condition was terminal. This is possibly the only known Australian piece of music actually written at Gallipoli. Devastated by the loss of Brooke, Kelly immediately began to sketch his Elegy for Strings Orchestra: ‘In Memoriam Rupert Brooke’. It would become his most well-known work, its modal tinges referring not just to the Greek location of the grave, but also to Brooke’s own fascination with classicism, while the oscillating passagework from the violins suggests the wind rustling through the leaves of the olive tree bending over the grave. The Grantully Castle steamed off toward Gallipoli at 5.30 a.m. the next day and remained just a few miles offshore for the next five days in a support role, as Kelly watched the Australian and New Zealand attack on Anzac Cove, again enjoying his creature-comforts while doing so: ‘I don’t suppose anyone ever viewed a battle in progress in greater comfort than we did the attack on Achi Baba,’ he boasted in his diary. But that comfort was to be short-lived, for on 29 April 1915, Kelly himself was called into action and over the course of the next eight months on Gallipoli he would be wounded twice. While in the trenches during the first weeks of the campaign, Kelly continued to work on the Elegy, completing it while convalescing in an Egyptian hospital after being wounded in the foot in June. He then went on to complete his ‘Gallipoli’ sonata for violin and piano in December 2015. Kelly eventually survived Gallipoli and was in fact one of the last British officers to leave during the evacuation on 8 January 1916, winning the Distinguished Services Cross for gallantry. Still fit, he continued to see war, as he was redeployed to the Somme in France. One of his last acts in the mud-filled French trenches was to add a harp part to the Elegy, the work that bookended a military career that had begun so unpromisingly, but ended heroically in the storming of an enemy position near the village of Beaucourt sur l’Ancre. On a foggy day, 13 November, Kelly was killed in a hail of machine-gun fire. He was 35 years old. He is buried in the Martinsart British Cemetery. 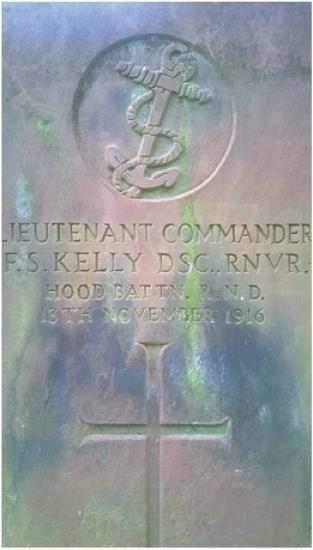 Gravestone of Frederick Septimus Kelly (1881-1916) – composer, soldier, rower.